Encaustic Art NewsPlease come to my solo show at the Workhouse Arts Center, 9601 Ox Road, Lorton Virginia, titled “From Suffrage to Secretary of State”.The show runs from March 5-April 6, 2014. The opening reception is this Saturday, March 8, from 6-9 pm. Want to buy my work for cheap?Visit my studio and check out my new 8’x10″ encaustic series, all priced at $200. Or.. see the show titled “March 150” at Target Gallery, 105 N Union Street, Alexandria Virginia , and purchase a piece of my art. The show runs from March 8- 23. All art is $150 and benefits the March of Dimes. The art party for this event is Friday, March 14th. We encaustic artists love to see each other’s work, or find great places to order out paint. My favorite paint company is jerrysartarama.com. Because they are located in North Carolina, I can order my paint from Virginia, and have it at my door in a couple of days,with no special fees to get it there so fast. 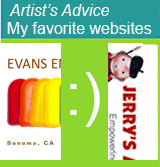 My other favorite place to buy encaustic paint is Evans Encaustics, http://www.evansencaustics.com/. This is the place to buy “fancy” colors, such as metallics, or beautiful shimmering reds or blues. Plus, she has a really interesting blog about encaustic, encaustic painters and paintings.